Foreign tourists used to splurge at American retailers as if they were all dollar stores. U.S. prices looked cheap to many foreigners compared to what was on sale back at home. It was a great deal for the U.S. shops. Landmark department stores in tourism hubs like New York City lured in customers without needing to offer big promotions that eat into profits. Not anymore. The U.S. dollar has skyrocketed against rival currencies like the euro, making goods sold in the U.S. far less attractive to foreigners. It's gotten so bad that it's hurting Macy's (M) bottom line. On Wednesday, the department store reported a surprise decline in first quarter profits. 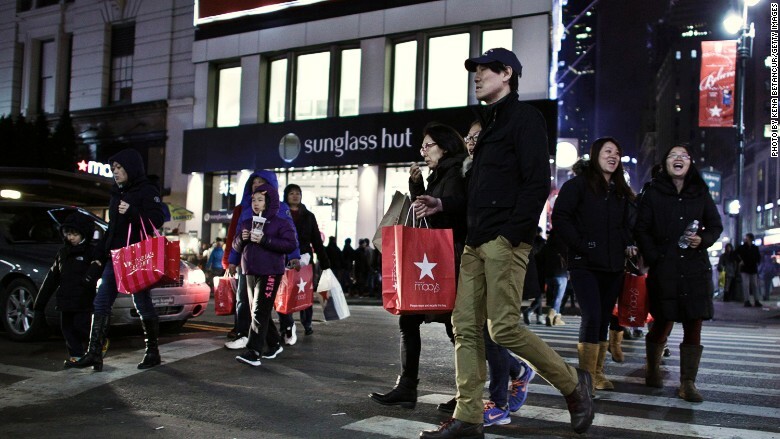 Macy's partially blamed a spending slowdown by international tourists. Expect other retailers to have the same problem, especially on the luxury side. Purses in Europe and Asia suddenly look cheap compared to what's on offer in the U.S.
"When the tourists come here, there is some sticker shock. Their currency buys less," said Efraim Levy, an analyst who covers Macy's at S&P Capital IQ. Strong dollar = weak tourism sales: During the first quarter one euro fell as low as $1.05. That's a dramatic change from the year before when a euro got you $1.35. Macy's posted a 0.7% decline in first-quarter sales, sparking an unexpected contraction in quarterly profits. Shares of the company retreated almost 3% on the gloomy results. The department store pointed to shrinking tourism traffic in destinations with flagship Macy's and Bloomingdale's stores, including New York, Chicago, Las Vegas and San Francisco. Macy's iconic Manhattan store on 34th Street is a popular spot for tourists. Related: What the heck happened to Ralph Lauren? Of course, Macy's pointed to other factors for its profit slump, including severe winter weather and the West Coast port slowdown that delayed merchandise shipments. The company was also hurt by an internal reorganization. Still, get ready for other retailers to blame disappointing results on the foreign tourism factor. The euro has rebounded a bit to $1.13, but that's still a big decline from recent years. High-end stores favored by tourists like Nordstrom (JWN), Saks and Burberry (BBRYF) are the ones most susceptible to feel the brunt of the strong dollar, said Paula Rosenblum, who is a managing partner at RSR Research. Can Macy's slow fast fashion? Many of these big-name retailers, including Macy's, are also grappling with the fast-fashion craze. Younger shoppers are gobbling up less expensive apparel offered by the likes of H&M, Forever 21 and Zara. "The prices at H&M are crazy cheap. And people love the stuff. If you're a Millennial, you don't care if things last. It's not an issue. Cheaper is fine," said Rosenblum. Macy's has tried to blunt fast fashion by rolling out Macy's Backstage, an off-price business the company is testing. The first four pilot stores are poised to launch this fall in New York. Related: Is Abercrombie the next retailer to die? American consumers are sluggish, too: As if those challenges aren't enough, Macy's and all retailers continue to operate in a surprisingly sluggish consumer spending environment. Retail sales flatlined in March from the year before, missing expectations for slight growth, according to government stats released on Wednesday. "Saving an extra $50 per month at the gasoline pump hasn't moved the needle for overall sales," Peter Boockvar, chief market analyst at The Lindsey Group, wrote in a note to clients. Why? Boockvar pointed to consumers saving money, taking on less debt, student debt woes for Millennials and the rising cost of living not being offset by higher wages.